GREENPOINT — A North Brooklyn City Council candidate pledged that, if elected, he’ll take the city to court to lower the height of controversial 40-story towers slated for the Greenpoint waterfront. Stephen Pierson — who is trying to oust incumbent Stephen Levin for the 33rd District council seat — told DNAinfo New York he will demand that a court review the city's zoning decision in an attempt to prevent the developments of Greenpoint Landing and 77 Commercial St. from rising more than 15 to 20 stories. “The neighborhood can't support this many residents,” said Pierson of the proposed towers. “The neighborhood already has a dearth of transportation options...And there hasn't been an environmental impact study done in years. Simply from a community perspective these towers are way out of context for the neighborhood." Pierson said he would sue to lower the allowed height of the towers — potentially allowed to rise as high as 400 feet due to the 2005 rezoning of North Brooklyn's waterfront from industrial to mixed use — by filing for relief under Article 78, in which government decisions can be reviewed by a court. Pierson said the filing would be legitimate since the current development plans are based on an environmental impact study done in 2005, an "outdated" timeframe that does not consider the large influx of residents and buildings that have entered the area in the past eight years. 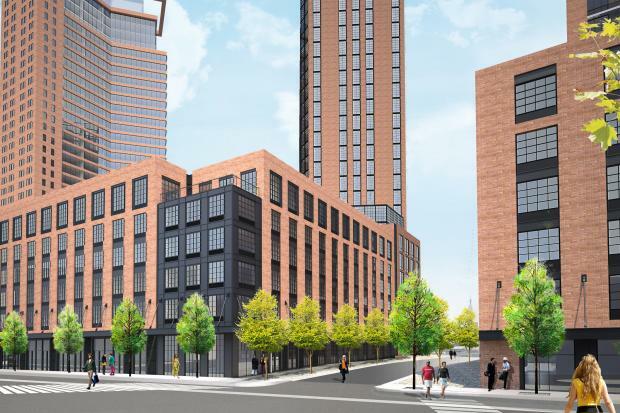 The filing would ask the state Supreme Court to change the developments from an R-8 zoning to an R-6 zoning, Pierson said, which would lower the buildings' allowed height to 15 stories. And he noted that elsewhere in Brooklyn at City Point politicians were also using Article 78 proceedings to block a real estate project due to an outdated environmental impact statement. A spokeswoman for Park Towers Group, developing Greenpoint Landing, declined to comment, and members of the Chetrit Group (developing 77 Commercial St.) did not immediately return calls requesting comment. A spokeswoman from the city's law department also declined to comment on the potential filing. Plans for the developments have been presented in public hearings and in Williamsburg and Greenpoint Community Board 1 meetings, and the proposals will go to the city for an ultimate stamp of approval. The two projects would bring about 6,100 new apartments to the Greenpoint waterfront, and have been called the "ugliest, scariest, most horrible plan" by some local residents. Meanwhile Levin said he also vehemently opposed the height of the towers, but he said he was not sure an Article 78 would actually work in this case. "I'm exploring now every option we have legally...but I don't want to make a promise I can't keep," Levin said. Pierson and Levin, neither of whom are lawyers, said they would consult their respective attorneys on the matter. Levin noted that the developers of 77 Commercial St. did not yet have the zoning to extend to 400 feet, but that the developers were seeking to obtain a further rezoning from the city through their ULURP (uniform land use review procedure) process. "Trust me I don’t want to see 40-story towers on the waterfront either," Levin said. "I'm doing whatever we can do to address that but I think it's also important to recognize that this rezoning did happen in 2005." Pierson said he would also attempt to scale back the towers' heights with a rezoning starting at the City Council and community board level to change the 2005 heights. He noted that the city scaled back allowed heights on Williamsburg's Grand Street in 2008, after officials found "developers...showed 'disrespect' to the neighborhood by constructing out-of-context buildings." "I am not opposed to development," Pierson said. "However, development must proceed responsibly, and within the context and infrastructure capabilities of our existing communities. I've seen no evidence that Greenpoint Landing and Commercial Street are responsible or can be supported by Greenpoint's infrastructure."